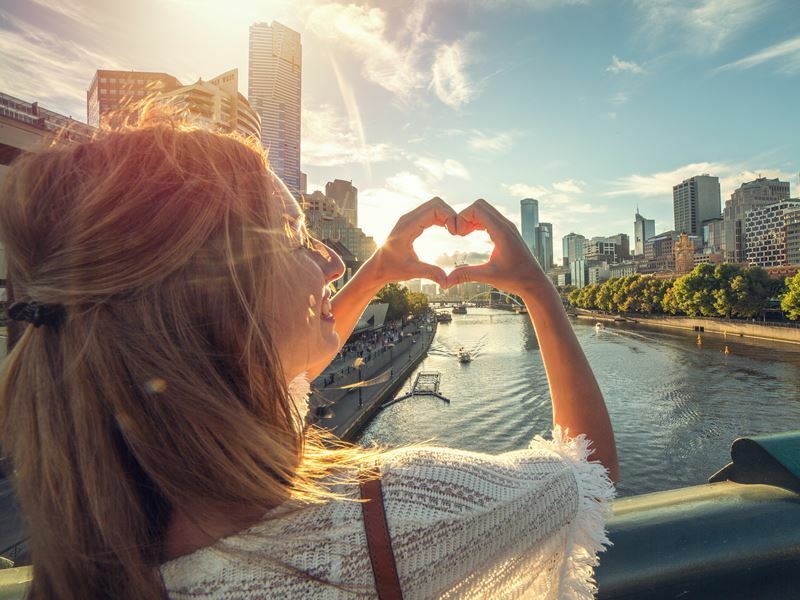 Located on the banks of the Yarra River, Australia’s Capital of Cool is loaded with some of the country’s most avant-garde street art, cutting-edge dining spots, iconic sports venues, and historic landmarks. We discover ten of the best things to do in the fashion-forward metropolis of Melbourne. Where: At the Melbourne Cricket Ground (MCG) on Brunton Avenue. What: Tempting sports lovers with over 2,500 artefacts and a compelling mix of exhibitions and interactive displays, the National Sports Museum captures all that is great and good about Australian sporting life. More than just a museum, it is a shrine to sport that celebrates individual heroes and key sporting events. Highlights: Spread over two levels of the Olympic Stand at the MCG, the National Sports Museum covers every single sporting pursuit. Must-see galleries include the Sport Australia Hall of Fame, Australian Cricket Hall of Fame, Australian Football Hall of Fame, and Champions Racing Gallery. Learn about Australia’s victories in the Olympics and Paralympics, marvel at the Malvern Star bicycle that Hubert Opperman rode in his record-breaking 24-hour cycling marathon in Sydney in 1940, and keep the kids amused at Game On! – an interactive gallery offering a range of simulated sporting experiences. Open daily from 10am to 5pm, admission costs £11 for adults and £5.50 for children aged five to 15. MCG tours are also available at an extra charge. Where: Operating within Melbourne's Central Business District. What: Hailed as one of the city’s greatest assets, the free-of-charge City Circle Tram is one of the best ways to take in Melbourne’s landmarks including Parliament House, Federation Square, City Museum, Docklands, Princess Theatre and the Melbourne Aquarium. Running clockwise and anti-clockwise, the service is available between 10am and 6pm from Sunday to Wednesday, and between 10am and 9pm on Thursday, Friday and Saturday. Trams run every 12 minutes. Highlights: Available every day of the year except Christmas Day and Good Friday, this gratis transport system features heritage trams that have been lovingly restored and painted in maroon and green with gold trimmings. Catch the tram at any of the specially marked stops to travel along the city centre loop that includes Flinders Street, Harbour Esplanade, Docklands Drive, La Trobe Street and Spring Street. The complete journey around the circuit (clockwise or anti-clockwise) takes 48 minutes and there is an automated audio commentary about places of interest along the way. Where: On Birdwood Avenue in South Yarra, south of the city. What: Established in 1846 and set over 99 acres, Australia’s finest inner-city oasis allures with sweeping lawns, majestic trees, duck and swan-filled ornamental lakes, and some 51,000 individual plants from 12,000 native and imported plant species. The gardens also provide a sanctuary for native wildlife including short-finned eels, common long-necked turtles, ringtail and brushtail possums, swamp wallabies, and over 170 bird species. Highlights: Join the award-winning Aboriginal Heritage Walk through the ancestral lands of the Boonerwrung and Woiwurrung people, meet microbats on an overnight eco-adventure, enjoy a picnic by the Ornamental Lake, and take the Australian Rainforest Walk. Also noteworthy is the National Herbarium, Tropical Hothouse, Plant Craft Cottage, Guilfoyle’s Volcano - a spectacular historical feature built in 1876 but recently restored as part of the landscape development project Working Wetlands. For kids, the Ian Potter Foundation Children’s Garden is a whimsical outdoor playground complete with a wetland area, bamboo forest, gorge, plant tunnel, child-sized water feature, and brand new Desert Island. The gardens are open daily from 7.30am to sunset and admission is free. Where: On Monbulk Road in Belgrave, 35-kilometres east of Melbourne. What: Best known for luring hikers and day-trippers to its 100-metre-tall Mountain Ash trees and lush fern gullies, the 3500-hectare Dandenong Ranges National Park is comprised of five main regions: Sherbrooke, Doongalla, Upper Ferntree Gully, Olinda, and Mount Evelyn. This forested heaven is also home to Puffing Billy, the century-old steam train that chuffs along the narrow gauge railway track from Belgrave to Gembrook, passing through the Dandenong Ranges. Highlights: Loaded with flora, fauna, and plenty of native birdlife including crimson rosellas, kookaburras, cockatoos, and the superb lyrebird, the park thrills outdoorsy types. Pleasure pursuits include bushwalking tours, cycling, horseriding, and picnics aplenty - most famously at Ferntree Gully Picnic Ground. Nearby, a string of mountain townships tempt with arts and antiques stores, eclectic restaurants, and quaint cafes. Many will be pleasantly surprised to find that the Devonshire tea tradition complete with freshly-made scones, homemade jam and double cream is de rigueur in the Dandenongs, especially at Miss Marple’s Tearoom in Sassafras and at the Kallista Tea Rooms in Kallista. Where: North of Melbourne’s Central Business District. What: Completed in 1880 to host Melbourne’s first international exhibition, the enduring UNESCO-listed Royal Exhibition Building was designed by Cornish-born architect Joseph Reed using a combination of structural styles: Rundbogenstil (round-arch), Byzantine, Romanesque, Lombardic and Italian Renaissance. Topped with an iconic dome resembling Brunelleschi’s Cathedral of Florence, the grandiose building seen today is the Great Hall, also known as Palace of Industry. The Royal Exhibition Building is one of the oldest still-standing exhibition halls in the world, and remains a venue for trade shows, fairs, and cultural events. 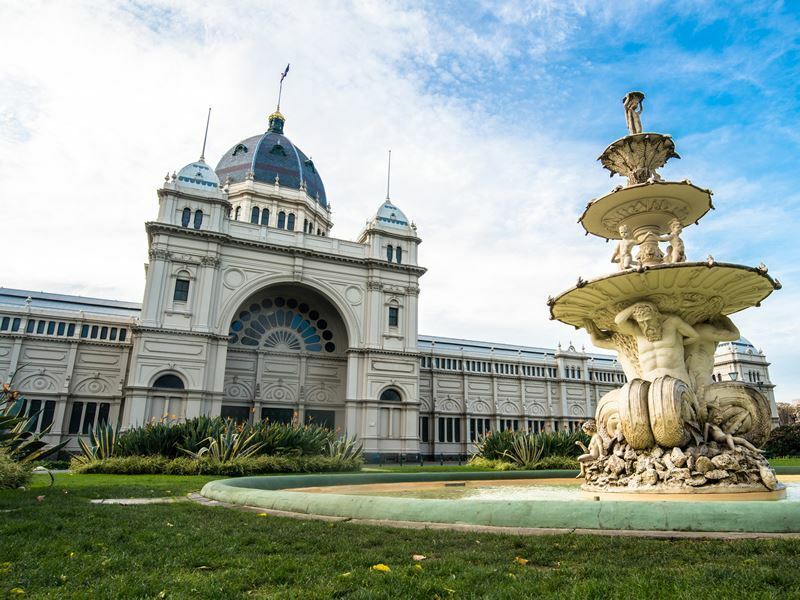 Highlights: The striking 64-acre Carlton Gardens houses the Royal Exhibition Building, Melbourne Museum, Imax Cinema, tennis courts and a children's playground. The gardens are in two parts: an axial garden layout to the south, and a landscaped garden to the north. Most impressive are the ornamental lakes, elaborate fountains, mature European trees, flowerbeds, sweeping lawns, Victorian-era Hochgurtel Fountain, and circular French Fountain. Guided tours of the Royal Exhibition Building and Carlton Gardens can be book through the Melbourne Museum. Where: At outdoor locations throughout the city. 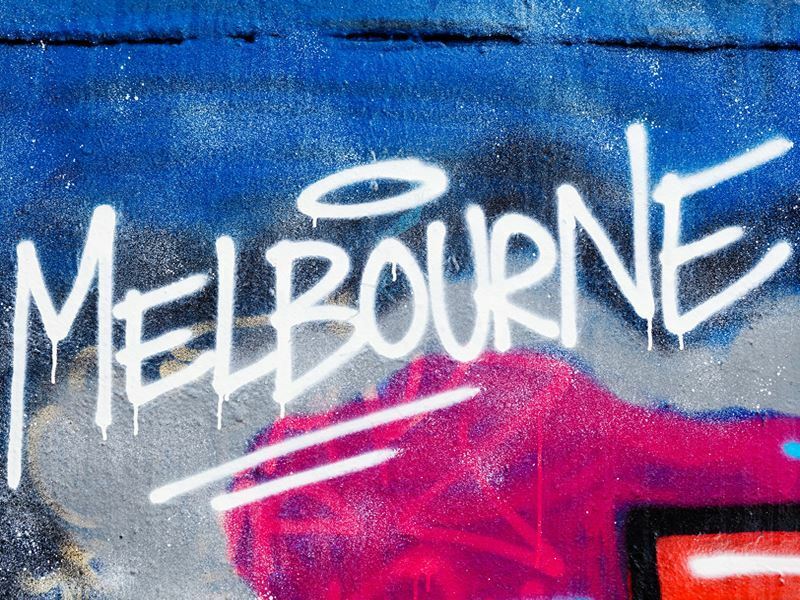 What: Melbourne is one of the world’s great street art capitals for edgy and awe-inspiring spray paintings, murals, stencilling and paste-up displays that that add colour and soul to the city. Vibrant and ever-changing designs can be seen on cobblestoned laneways, alleyways, arcades and street corners in approved locations. The most popular street art laneway is Hosier Lane, a short walk from Federation Square in Melbourne’s Central Business District. Every inch of wall space is covered in spray painting from some of the world’s best graffiti artists. Highlights: Melbourne’s love affair with all things arty continues in the markets. Head to the Rose Street Artists' Market for handmade offerings by some of the city's most establish artists and craftspeople, visit the Camberwell Market for second-hand treasures, and don’t miss Blender Lane Artists' Market for a variety of design, textiles and jewellery. Other gems include the Sunday Arts Centre for fine art, Finders Keepers Market for one-off designs, and the legendary Queen Victoria Market for artisan cheeses, dressed meats, and decadent gourmet delights. What: Although a temporary installation, the Albert Park Formula One Circuit is unlike any other. Developed for Melbourne’s inaugural racing event in 1996, it is set in a gorgeous park around a huge artificial lake midway between the towering city centre skyline and Port Phillip Bay. During the nine months of the year when the track is not used for Grand Prix preparation or the race weekend, it is a regular public road with a 50 km/h speed limit. Obviously, things speed up considerably every March for the season opening of Formula One Australian Grand Prix. Highlights: Those not lucky enough to be visiting Melbourne in March can take the Tours on Trike Grand Prix Lap (www.toursontrike.com.au) - a one-hour three-wheeling tour that follows the same track as the F1 racing cars. Lap around Melbourne’s Great Albert Park Lake, get the feel of the Start/Finish Line on the Grid, and enjoy the stunning view of the parklands along the way. Tickets cost from £55 per person. For timely travellers keen to experience the F1 frenzy in 2015. Where: Around 120-kilometres south of Melbourne. What: Located just 90-minutes from the city, the home of the Australian Motorcycle Grand Prix and Superbike World Championship is a wildlife wonderland famed for is white beaches, excellent swells, and little penguins who make their epic journey along the sands at sunset. Head to the western tip of the island for The Nobbies, a magnificent headland that is one and a half kilometres offshore from Seal Rocks - home to Australia’s largest colony of fur seals. On the southeastern tip is Cape Woolamai, much of which is covered with a state fauna reserve. Highlights: Whilst Churchill Island Heritage Farm, Koala Conservation Centre, Nobbies Centre, and Rhyll Trout & Bush Tucker Farm are all trip-worthy, the Penguin Parade is Phillip Island's biggest draw. Every evening at dusk, these adorable creatures take a waddle from the sea into their burrows in the sand dunes. 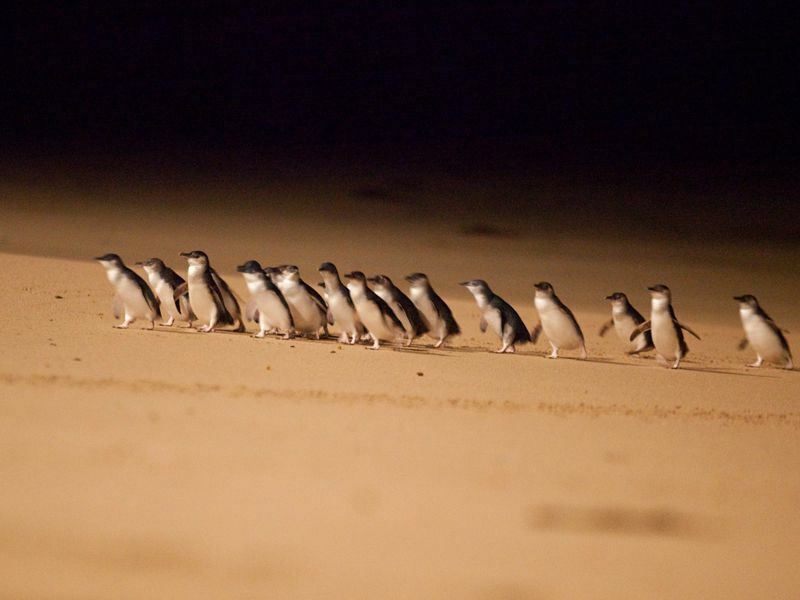 The procession lasts for approximately 50 minutes from the time the first penguin crosses the beach. There is a variety of ways to view the parade: from the main concreted terrace area, from elevated platforms, or on private eco tours with rangers. Where: Starting in Torquay, around an hour’s drive from Melbourne. 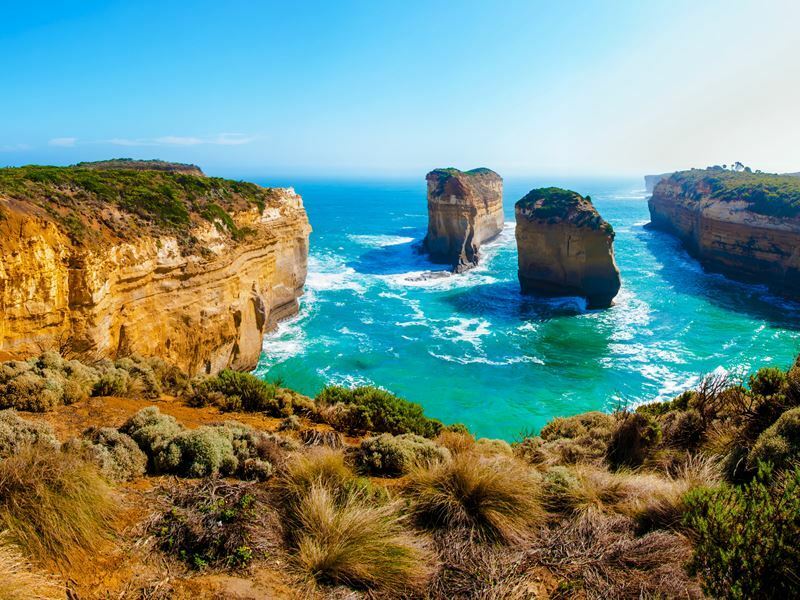 What: Famed as one of the world's greatest road adventures, the Great Ocean Road is the historically significant 243-kilometre stretch along Australia’s south-eastern coast between the cities of Torquay and Warrnambool. Built in the 1920’s by the country’s returning servicemen, the highway is fast-becoming a hub for outdoor adventurers keen to experience hiking, scuba diving, coastal walks, sea kayaking, and iconic surf breaks. Highlights: The Great Ocean Road allures with plenty of natural splendours; from the magnificent rock formations known as the Twelve Apostles that rise up from the Southern Ocean on Victoria's dramatic coastline, to the Great Otway National Park where you can check out some of Australia's best rainforest scenery. Wildlife fans should head to the Tower Hill State Game Reserve to get up close with koalas, emus and kangaroos, while winelovers should sample the delights of grape-growing regions Geelong and Henty. Other essential viewing and doing includes surfing at Bells Beach, visiting the charming seaside village of Port Campbell, exploring the hinterland at Wye River, and bush walking at Apollo Bay. What: Everything hip that is happening foodwise happens in restaurants, cafes, bistros, coffee shops and bars located in Fitzroy, Collingwood, Chinatown, Richmond, Carlton's 'Little Italy’, South Yarra, and the Central Business District. From classic favourites to hip newcomers, Melbourne’s reputation as one of the world’s coolest dining destinations is certainly gaining pace. Head to Taxi Kitchen in Federation Square for contemporary cuisine and some of the best views of the city’s skyline, or tuck into Mediterranean fusion food at The Botanical on Domain Road for a super-sleek brasserie experience. 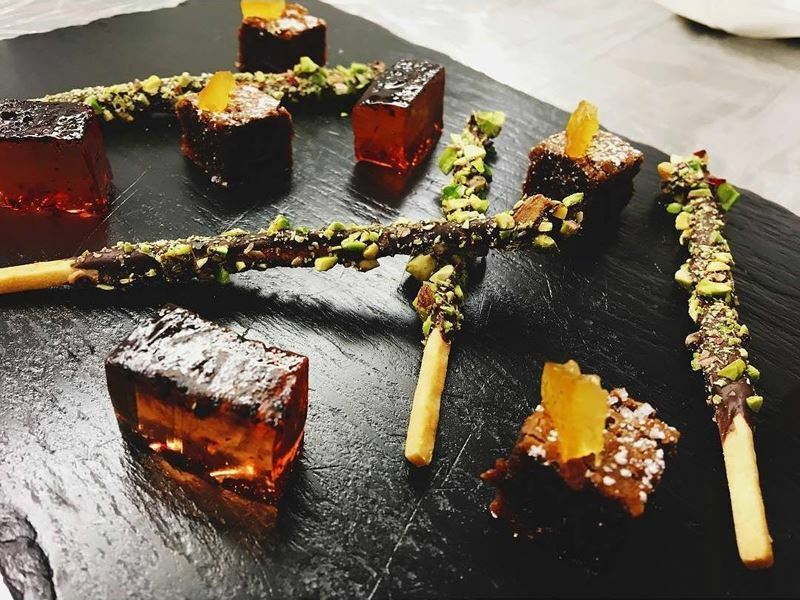 Highlights: For gourmet treats and fresh local produce, the Melbourne Food and Wine Festival is a must-do for foodies. Running from Friday 27 February to Sunday 15 March 2015 in Queensbridge Square, this annual event launched in 1993 to promote Melbourne and Victoria’s food and wine culture. Festival favourites include the Langham Melbourne MasterClass where the world’s top chefs share their tricks and techniques, Perfect Match where food pairings are explained, and Restaurant Express where over 70 of the city’s most celebrated restaurants offer fine food and wine at dramatically reduced prices.